Being overly kind isn't in Kylie Harrow's nature. This has never been more evident than when Kylie vents her frustrations to an innocent employee -- and the whole scene is posted online, tanking her career and earning her the dubious distinction of "World's Worst Boss." But when she flees home to the South, Kylie finds her childhood home has changed. The high school quarterback is now the hot and handsome sheriff. Her mother has turned her home into a nudist colony. And worst of all, having heard about her daughter's exploits, her mother won't let her in the door until Kylie completes fifty kind acts in fifty days. The task seems easy enough at first -- and may even help repair her media image -- but it quickly turns into a hilarious quest that leads Kylie down a bumpy road filled with new challenges. What started as a gimmick to save her career evolves into a mission to save a spunky old woman and her little dog from homelessness. As Kylie learns about the nature of kindness, she finds the path to happiness and, for the first time ever, maybe even love. "Even at her most un-kind, I fell in love with Kylie! Her journey is not only funny and exciting but also heartwarming and inspiring. Ellyn Oaksmith has created one for the keeper shelf!" Log In to track Ellyn Oaksmith on eReaderIQ. 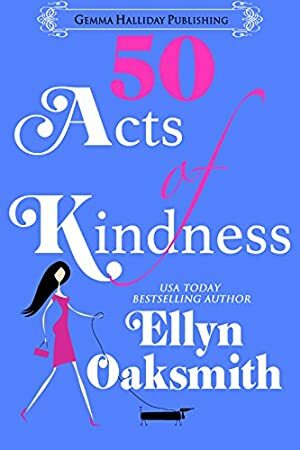 to be notified each time the price drops on any book by Ellyn Oaksmith. to stop tracking Ellyn Oaksmith. We started tracking this book on May 19, 2015. The price of this book has changed 23 times in the past 1,434 days. The highest price to date was $4.99 last reached on February 20, 2019.